Nevada City, CA April 13, 2019 – As Spring Break kicks off this weekend for much of Nevada County, students and families are expected to head to the Yuba River to soak up the beautiful scenery and sunshine. However, heavy snowpack in the Sierras this winter has created dangerously cold, high flows on the Yuba. It will be several months before it’s safe to swim. 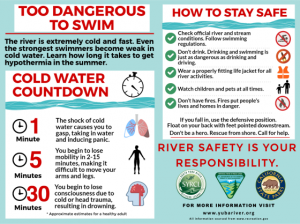 Given these dangerous conditions, the South Yuba River Citizens League (SYRCL) and California State Parks River Ambassadors will be making a special appearance at the Highway 49 Crossing this weekend to help get the word out to visitors that the river is extremely cold and too dangerous for swimming. From Memorial Day to Labor Day, you will find River Ambassadors at major river crossings along the South Yuba River State Park, reminding guests about safety, the polluting impacts of trash and dog waste, the dangers of broken glass, and the catastrophic potential of wildfire. 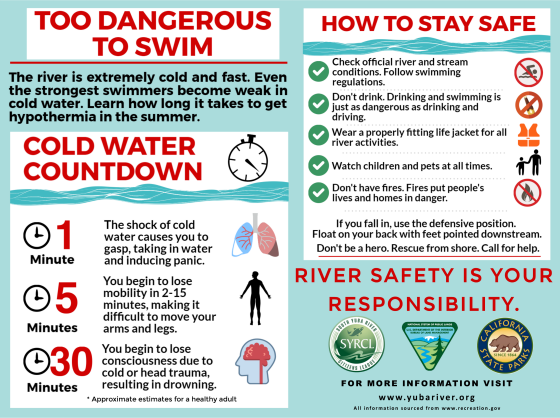 This spring, River Ambassadors will be promoting a message of extreme caution to help visitors stay safe. This year’s high flows and cold water are a serious safety concern. Ambassadors will be reminding people to be safe and stay out of the river. Thanks to its stunning emerald swimming holes and picturesque granite boulders, the South Yuba River is one of the most visited attractions in Nevada County. Each year, the river attracts an estimated 700,000+ visitors to the trails and sandy beaches of South Yuba River State Park. More visitors mean more coolers, more dog waste, more trash, and a greater risk of fire in the dry canyon. This is the eighth season that SYRCL and State Parks have collaborated on this critical summer volunteer program. “We are needing more help from our community to keep the River Ambassador program going strong. SYRCL and State Parks are seeking 40 volunteers to join the program for the 2019 summer season. If you’re interested in helping to preserve and protect our stunning Yuba River and our river community, join our River Ambassador Team,” said Belshe. 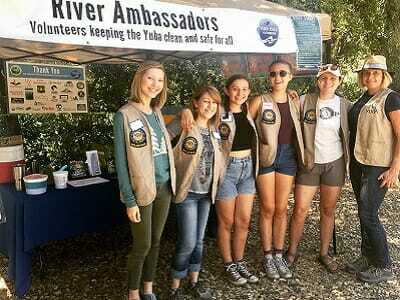 The next chance to become a River Ambassador will be on Saturday, May 18, 2019 from 5:30-8:30 PM, at the SYRCL office, 313 Railroad Ave, Nevada City. For more information on becoming a River Ambassador or to sign-up, please visit www.yubariver.org or contact Andrea Tineo, Stewardship Coordinator at atineo@yubariver.org or 530-265-5961, ext. 212.